Fiona lands herself in a fairground fluster in this conclusion to the mischievous and charming Not-So-Ordinary Girl trilogy. Fiona is tired of hearing “no” from everyone. Especially when it is followed by: “You’re not old enough.” Can she go all the way to California by herself to visit her mom? “Not on your life,” says Dad. Can she do something more exciting than handing out maps at the Great Ordinary Fair along with the rest of Mr. Bland’s class? “Not until next year, when you’re in fifth grade,” answers Mr. Bland. 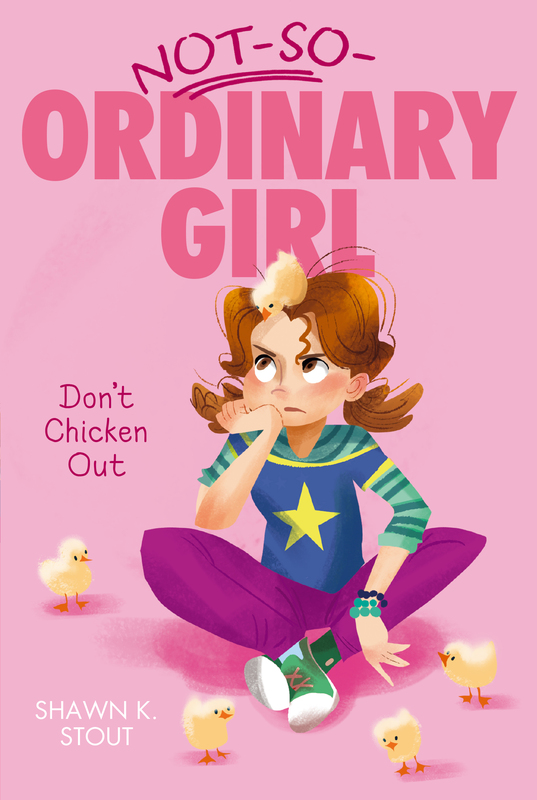 Fiona sets out to prove that she is, in fact, old enough to do things on her own—and ends up babysitting chickens in the fair’s poultry pavilion. It’s not easy being trustworthy and mature, especially when nobody is paying attention. But when the feathers start to fly at the Great Ordinary Fair, Fiona sticks her neck out for a new friend (and a bunch of chickens) and learns a few things about herself and what it means to take responsibility, even when things go really wrong. Fiona Finkelstein was flat-out tired. Talking to grown-ups always made her that way. Especially when their answer was NO SIRREE BOB, NO WAY JOSÉ, NOT ON YOUR LIFE YOUNG LADY. That was their answer a lot of the time lately. It wasn’t the “no” by itself that was so bad. It was all of the other stuff that always and forever came along with it. For example, just this morning, when Fiona asked her dad if they could get a real live monkey named Mr. Funbucket that she could keep in her room, Dad didn’t just say no. He went on and on forever and ever about how monkeys are not pets and how they belong in the jungle and how speaking of jungles, had she cleaned her mess of a room yet? But what she wanted to know was, why did everything have to do with her mess of a room? “Not a chance,” he said. At school there were more nos. “Can we take a field trip to California?” Fiona asked her teacher, Mr. Bland. They had just started talking about the California gold rush in social studies when Fiona brought it up. “Sure,” said Mr. Bland. “We can leave tomorrow.” Only, he didn’t say it in a Fiona-you’re-a-genius-that’s-the-best-idea-I’ve-ever-heard kind of way. “Oh, Boise Idaho!” said Harold Chutney, who apparently didn’t get that what Mr. Bland was really saying was N-O. This isn’t Minnesota, Fiona wanted to say out loud. This is Ordinary, Maryland. And nothing much happens in Ordinary. The whole class shouted “Where?” at the same time. Fiona gripped the sides of her desk and waited. Fiona let go of her desk. She folded her arms across her chest. That wasn’t even close to California. “That might be fun,” said Milo, looking at Fiona for approval. Fiona chewed on her Thinking Pencil. The fair might not be a trip to California, but it could still be okay, as long as they could be in charge of games or rides or even parking. Anything except . . .
Fiona moaned. “Not maps! Maps are just as bad as tearing tickets.” Which is what she’d had to do at last year’s fair. Oh boy, the paper cuts. “I don’t want to hear any complaints,” said Mr. Bland. “I like maps,” said Harold. “Mrs. Weintraub’s fifth grade has that covered,” he said. In the cafeteria, Fiona’s mind was stuck in California. How she could get there. How she could see her mom again. Fiona’s mom was an actress in California, and lately Fiona saw her more on TV than she did in real life. And that wasn’t working out. Without even thinking, Fiona bit into the corned beef sandwich that Mrs. Miltenberger packed. She even chewed and swallowed it. The next thing she knew, her best friend was waving her hand in front of Fiona’s face. “Hello?” said Cleo Button. “Huh?” Fiona’s brain snapped back to Ordinary. She swallowed. Why did she have that awful taste in her mouth? “What’s the matter?” said Cleo. Fiona pulled apart her sandwich and examined its insides. “Ugh. Corned beef.” She gulped her milk to wash away the taste. Milo and Harold shot Cleo a Doom Scowl loaded with extra Doom, because Fiona’s mom living in California had been a sore subject lately. Which apparently Cleo had forgotten. “What does that have to do with anything?” said Fiona. “I never heard of that rule,” said Cleo. “You’re making that up,” said Fiona. “You’re not helping, Harold,” said Fiona.